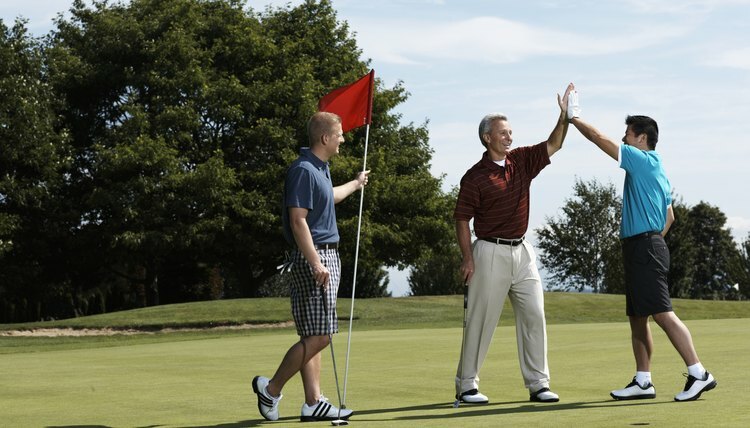 Different games allow you to add an extra incentive and focus to your round of golf. Golf is a tricky game. For many, the idea of going out, focusing on your swing and trying to keep track of your ball and the amount of shots made on a hole is plenty. Sometimes, however, adding a little extra spice to the game, can make for a memorable afternoon on the links and possibly allow you to leave the course with a little extra money in your pocket. With Bingo Bango Bongo, the game of golf becomes as crazy as the name. This is a money game where you break each hole up into three parts, a point going to the winner of each part of the hole. The scoring rewards both luck and good play. The first point is awarded to the first person to get on the green, no matter how many strokes it takes him. The second point is awarded to the person whose ball is closest to the hole, once everyone is on the green. The third point goes to the person who has the lowest amount of strokes at the end of the hole. You can divide up the spoils at the end of each hole or you can keep a tally and figure it out at the end of the round. If you'd rather take the skill component out of the game, you can also play first one in the hole, regardless of strokes, instead of low stroke total. Match play is best when you have head-to-head competition. If you have a foursome, you can divide your players up so that there are two head-to-head competitions going on or play one team against the other. Basically, you start with 18 holes (you can use 9 if you'd rather). The winner of each hole gets a point. So, if you play two holes and the same person, or team, wins both holes, that person, or team, would be 2 up with 16 to play. Eventually, if play between those going head-to-head is uneven, you'd reach a point in the round where the better golfer, or team, leads by an amount that would be insurmountable and the game would, for all intents and purposes, be over. Skins is an exciting format. So exciting in fact, that network television commonly sets aside prime time hours in order to televise the world's top pros battling it out in a skins game. The scoring is easy. The winner of the hole (or lowest score for the hole) gets the skin. When there is a tie on a hole, no one wins and the skin carries over to the next hole. If you had a tie on every hole up to the 18th, the 18th hole would be worth all 18 skins. The scramble format is one of the most popular games with big golf outings, particularly ones where you have a diverse set of skill levels. Each foursome on the course plays for the best stroke total. The difference between a scramble format and normal stroke play is that you only use your team's best ball. That means that, if someone pounds a drive, all players on the team drop a ball at that point and play from there. You go through each shot that way, including putts. Scramble takes pressure off of unskilled golfers, allowing them to more thoroughly enjoy the round without having to worry about hitting a quality shot the entire round.